Now call back from more than 30+ countries is available. 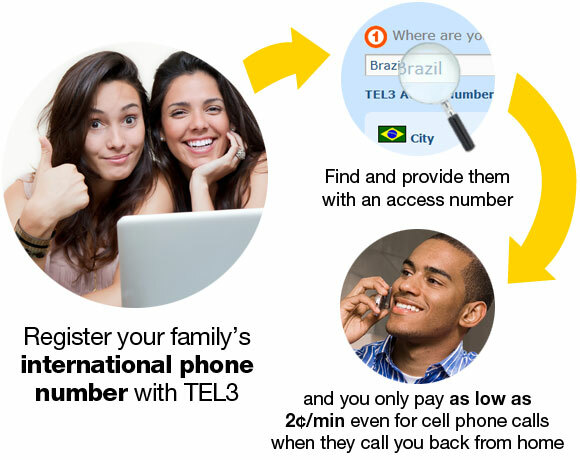 Calling back from any country in the TEL3 network to the U.S. is much cheaper (about 2¢/min for all continental U.S.). So, now users can take advantage of that and pay much less with TEL3. How Call Back works for consumers. Significant savings for the customers. Customers in the U.S and Canada can save on all calls with this service by giving TEL3’s International access numbers to friend and family. You can start promoting our new service with your promo code now. Your Top Up commissions will be added to your regular ACH payment on Wednesdays. See the commissions per carrier and country. Existing agents, log in here. © TEL3. All trademarks and logos are the property of their respective owners. All rights reserved.